The Atacama Pathfinder Experiment (APEX) telescope — captured in this dramatic image taken by ESO Photo Ambassador Babak Tafreshi — is one of the tools used by ESO to peer beyond the realm of visible light. It is located on the Chajnantor Plateau at an altitude of 5000 metres. Clusters of white penitentes can be seen in the foreground of the photograph. The penitentes (Spanish for penitents) are a curious natural phenomenon found in high altitude regions, typically more than 4000 metres above sea level. They are thin spikes of hardened snow or ice, with their blades pointing towards the Sun, attaining heights from a few centimetres up to several metres. APEX is a 12-metre-diameter telescope that observes light at millimetre and submillimetre wavelengths. Astronomers observing with APEX can see phenomena which would be invisible at shorter wavelengths. 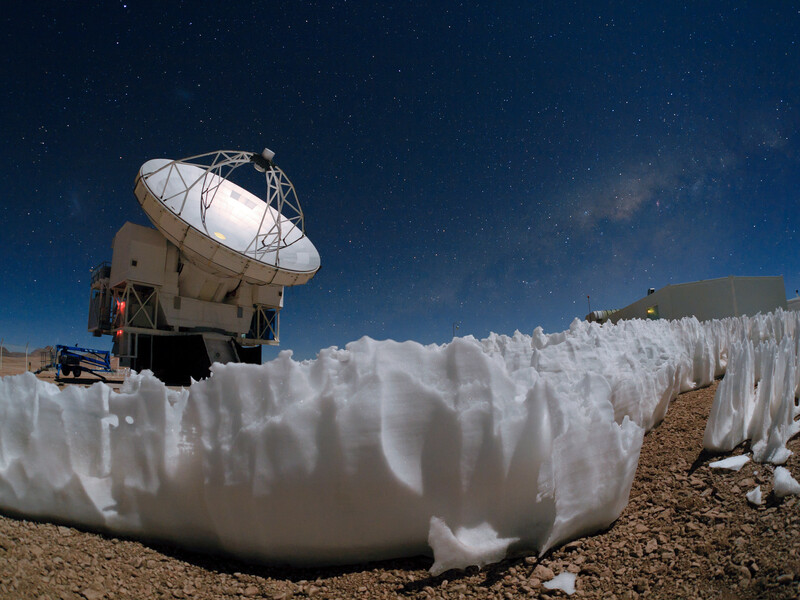 The telescope enables them to study molecular clouds — the dense regions of gas and cosmic dust where new stars are being born — which are dark and obscured by dust in visible or infrared light, but which glow brightly at these relatively longer wavelengths. 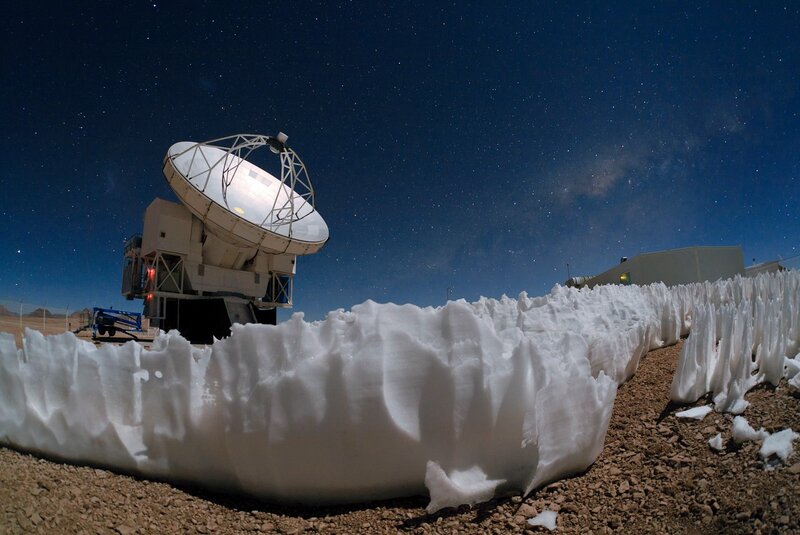 Astronomers use this light to study their chemical and physical conditions. This wavelength range is also ideal for studying some of the earliest and most distant galaxies in the Universe. Just visible in the night sky above and to the left of APEX are, respectively, the faint smudges of the Small and Large Magellanic Clouds, neighbouring galaxies of our own Milky Way galaxy. The plane of the Milky Way itself can be seen as a hazy band across the sky, most prominently over the APEX control building on the right. Dark patches in the band are regions where light from distant stars is blocked by interstellar dust. Hidden behind these dark dust lanes, the centre of the Milky Way lies at a distance of about 27 000 light-years. Telescopes such as APEX are a crucial tool for astronomers to peer through the dust and study the centre of our galaxy in detail.